Malabsorptive operations restrict both food intake and the amount of calories and nutrients the body absorbs. 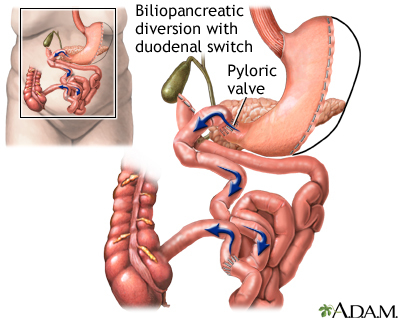 In this procedure, a larger portion of the stomach is left intact, including the pyloric valve that regulates the release of contents from the stomach into the small intestine. The duodenum is divided near this valve, and the small intestine divided as well. The portion of the small intestine connected to large intestine is attached to the short duodenal segment next to the stomach. The remaining segment of the duodenum connected to the pancreas and gallbladder is attached to this limb closer to the large intestine. Where contents from these two segments mix is called the common channel, which dumps into the large intestine.